If you are thinking about jewelry trends and what to wear in 2019, you have reached the right place. And even though the time is still young and new trends could emerge this year, we have rounded up the most important jewelry trends in 2019 so far. In this article, you will discover great style inspiration that will enable you to look as if you have just come down from a fashion magazine’s cover. If you want to buy precious & semi precious stones jewelry, read further to see the greatest jewelry trends in 2019. 2019 will be the year of bold, chunky jewelry pieces. Oversized designs, shiny metallic looks or vibrant gemstones are must-have creations this year. Nature-inspired jewelry will also be an important trend, with the focus on celestial jewelry and flower designs. A new trend that we all love is here to stay as well. We are talking about enamel jewelry which only gets more colorful this year. And there’s more good news. In 2019 you will never be out of spare change. Just kidding. However, coin jewelry takes the lead and we will see many interesting necklace designs, as well as rings and earrings that feature coins. When it comes to gemstones, pale stones like pearls, moonstones, and rose quartz will be very trendy. Other jewelry trends that incorporate gems will focus on vibrant blue stones like the lapis lazuli or sapphire. Last, but not least, hoops are here to stay. They become bigger and bolder so you will have a lot of fun with your jewelry this year. And now that we’ve talked about the general jewelry trends, it’s time to go into detail. Read further to discover inspirational pieces in 2019 as well as advice on how to wear them. At the end of last year, we saw a new trend emerge – oversized links. You will be glad to find out that this is only the beginning. In 2019, oversized chain link necklaces are simply fabulous. Either as long lariats or stunning collars, chain link necklaces are here to stay. Of course, this trend will also be incorporated into earrings and bracelets designs. If you want to stay on top of jewelry trends, get yourself a nice pair of drop earrings featuring oversized links and a chain link bracelet. If we are talking about metals, a polished silvery look is the best way to wear this trend. Try a chain link collar necklace with a pair of ball studs and a solid color blouse to get a smart casual look. Wear your chain link earrings with a silvery gown to showcase an impeccable monochrome look. Last, but not least, wear your chunky link bracelet to work to add a powerful touch to your sharp outfit. You probably saw this one coming when coin necklaces started to emerge at the end of last year. 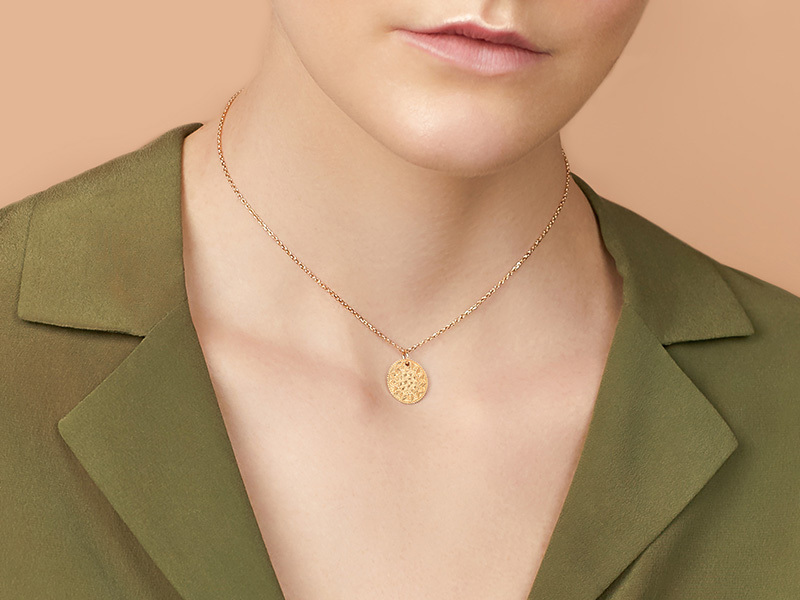 Either dainty and subtle or chunky and bold, coin necklaces are simply amazing. But guess what? As far as jewelry trends go, in 2019, coins will also be incorporated in rings, earrings, and even bracelets. For a statement look, try a layered necklace featuring multiple coin pendants and wear it with a deep-V blouse. Swap your delicate ring for a coin ring when you go to a cocktail party. Wear a pair of coin earrings with large pants and layered scarves for a boho-chic look. A coin bracelet, on the other hand, will look very romantic when you pair it with your favorite flowery dress. We called it. Hoops are here to stay, that’s what we’ve been saying for the past year and guess what? We were right. However, if in 2018, thin gold hoops were the craze, in 2019, hoop earrings get chunkier. Oversized thick statement hoops in either gold or silver are important jewelry trends this year. The best part is that you can even wear them with your hair down and let them peak through the hair strands. If you want to get a bold look, you can also try a pair of mismatched hoops. Twisted hoops are also fashionable so you have a lot of options to choose from. A word of advice, though. When you are wearing oversized hoops, forget about the other jewelry trends of 2019. Leave your chunky link chain necklace at home and your coin ring as well. Oversized hoops don’t play well with other statement jewelry, so keep your other pieces minimal. Sounds magical, doesn’t it? As far as jewelry trends go, this is one of the most interesting of 2019. Think about earrings in the shape of a half moon, star necklaces and other celestial shapes featured in your jewelry. And since stars also shine, guess what? Clear crystals and polished designs will make your celestial jewelry look magical this year. And since we are talking about nature-inspired pieces, be on the lookout for flower designs as well. From earrings to necklaces, those feminine and delicate flowers will look fabulous this year. If you enjoyed reading about the jewelry trends in 2019, stick with us. We publish daily articles with creative style inspiration, so make sure you check our blog periodically for new content. If you want to shop for any of the creations featured in this article and discover more trendy jewelry collections, visit Ana Luisa online jewelry shop.